Over the past 25 years, social movements have actively sought out and used new information and communication technologies (ICT), such as the Internet and mobile phones, to give voice to their concerns. The growth of access and use of ICT in the Middle East and North Africa provided resources for protesters and governments to influence political and social events. The widespread availability of the Internet and mobile phones to facilitate organization and action raises the research question of how ICT affects protest movements. Au cours des 25 dernières années, les mouvements sociaux ont activement recherché et utilisé les nouvelles technologies d’information communication (NTIC), telles que l’Internet et les téléphones mobiles pour faire entendre leurs préoccupations. La croissance de l’accès et de l’usage des TIC dans le Moyen-Orient et en Afrique du Nord a fourni des ressources aux manifestants et aux gouvernants pour influer sur les évènements politiques et sociaux. La disponibilité généralisée d’Internet et des téléphones mobiles pour faciliter l’organisation et l’action, soulève la question de la recherche de la manière dont les TIC influent sur les mouvements protestataires. 1As information and communication technologies approach ubiquity they also gain considerable social and political application and influence. At the same time, any technology that has enabled diverse views to be expressed has also been a target of control. Over the past 25 years, social movements have actively sought out and used new information and communication technologies (ICT) to give voice to their concerns. The transmission and exchange of information, and the use of information and communication technologies, are a common element in protest movements, from the use of satellite television to report on Tiananmen Square in 1989 to the use of e-mail by rebels in Chiapas in 1994 to the organization of protests in Tunisia and Egypt in 2011. Significant in recent protest movements is the widespread availability of the Internet and mobile phones to facilitate organization and action, which raises the research question of how ICT affects protest movements. 2While the Middle East and North Africa (MENA) region contains few affluent economies, the growth of ICT, especially mobile phones, provides an important vehicle for communication and interaction. No longer the domain of the affluent, ICTs such as mobile phones are increasingly common in even low income countries. Access to a range of ICTs brings with it new opportunities for information exchange and communication, but they also can be seen as a technological and generational challenge to the hierarchical social order of many MENA societies. The growth of social networking, such as the 2009 introduction of Facebook in Arabic, confronts governments trying to restrict networking activities and their use for organizing opposition. The recent experience of democracy movements in a number of MENA countries (Tunisia, Libya, Egypt, Syria) shows how information and communication technologies during times of social protest and unrest can be significant forces for organization and mobilization. The Arab Spring also serves as an example of the Internet evolving to a phase of contested access (Palfrey 2010) after less scrutiny in the past. 3Before continuing it is worth noting the significance of the term, “Arab Spring.” The expression carries many positive meanings that apply to both its English and Arabic roots. As Ibrahim Abusharif (2013) notes, “The Arabic word for "spring," rabi’, conveys key metaphors associated with its English counterpart, like renewal, hope, and fresh growth.” The protests were met by many observers and participants as positive events leading to democratic political change, yet several years later the results are mixed. Generally, the term is presented without quotation marks, although there is common, but less frequent, use of “Arab Spring” to indicate that the meaning does not match the outcome. Sadiki (2012) sees the use of quotation marks as a sign of lingering doubt about the truth of the expression. The positive, and often media driven, use of the term Arab Spring has yet to achieve its expectations in the eyes of many observers. 4Through history, new information and communication technologies have represented opportunities for expression as well as vehicles for control. The printing press, telegraph, telephone, photocopier, television, and Internet are all powerful forces to spread ideas, as well as being technologies of control. The use of information technologies to spread ideas is now new, and conflict over the dissemination of ideas is a part of human nature that can be traced back centuries if not millennia. For example, Martin Luther’s critique of the church in 1517 started with the public display of grievances on the door of a church. The ideas were spread quickly by use of the then new invention of the printing press with moveable type. Gutenberg’s technology facilitated the spread of ideas and enabled dissent four hundred years ago. 5More recently, regimes have sought to limit access to, and use of, information technologies as a way to limit the flow of ideas and spread of dissent. The goal of controlling information remained the same, but the target was the emerging set of electronic information technologies. In the 1980s, students in France used Minitel to coordinate protests against the national government, while television was a valuable medium to spread news about the uprising in Tiananmen Square in Beijing. The rebels of Chiapas publicized their discontent with Mexico’s national government through e-mail and the nascent Internet, while Burma’s ruling powers limited access to mobile phones yet video images of protesting monks quickly made their way electronically via Bangkok to the world news market. Antigovernment protests in Thailand in 2005-6 used Internet, satellite and local broadcast media to organize and promote ideas counter to the government Chaisukkosol (2010). As a nonviolent protest movement the Thai government relied upon legal measures to try to limit the flow of information, although efforts were thwarted by routing information outside the country and then returning it. The government invoked national security as rationale for limiting information flows, while malware and denial of service attacks on protest websites were also attributed to government agencies. 6Analysis of the scale and scope of ICT use in the MENA countries illustrates the power available to organize social and political action by individuals, as well as the role and reaction of the state to ICT use. The paper argues that while ICT is a facilitator of democratic movements it is also subject to controls and intervention from governments seeking to limit public expression; ICT becomes both a weapon against government and a target for state action. This paper will review the condition of ICT infrastructure in the Middle East/North Africa region, followed by a discussion of the use of ICT in Arab Spring movements and the implications of ICTs role. 7Recent protests in the Middle East/North Africa region illustrate the link between information technology and dissent, although caution needs to be exercised in attributing causality or too much power to technology alone. Before discussing how ICT was used in protest movements, it is valuable to review the state of ICT infrastructure in the region, especially as it has changed dramatically over the past decade. 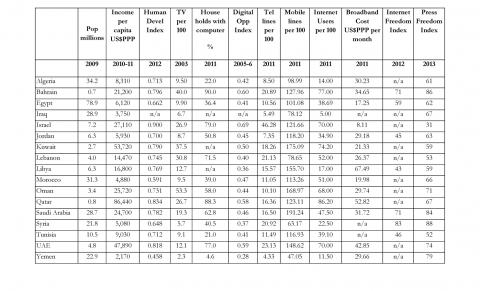 Data on population, income and ICT infrastructure are presented in Table 1. 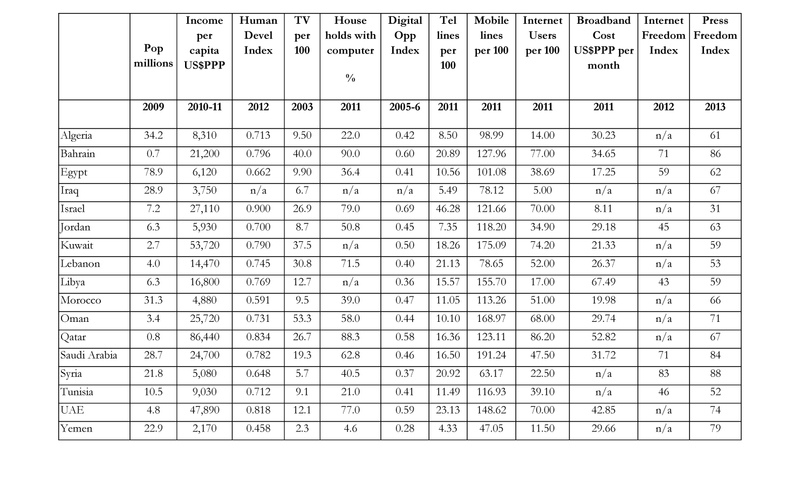 The data sources used in the table include: 1) Population by country from the US Census (2012); 2) Gross national income in US$ adjusted for purchasing power from the World Bank (2011); 3) Human development index (HDI) from the United Nations Development Program (2012); 4) Televisions per 100 population from the US Central Intelligence Agency (CIA 2003); 5) Percentage of households with computers from the International Telecommunications Union (2012a) report Measuring Information Society; 6) Telecommunications data on landline and mobile phone subscribers, and Internet users from the International Telecommunications Union database (ITU 2012b); 7) Wired broadband cost per month in US$ adjusted for purchasing power from The Global Information Technology Report 2013 (Bilbao-Osorio 2013); and 8) Freedom of the Internet and of the press represented as indices calculated by Freedom House (2012 & 2013). 8The region containing the Arab Spring countries ranges from Morocco in the west to Iraq in the east. Common to most of these countries is concern by residents for employment and economic well-being, as well as often severe limits to access to information and the ability to voice dissent. Of these countries, population ranges from less than one million in Bahrain and Qatar to more than twenty million in Iraq, Saudi Arabia, Syria and Yemen and almost eighty million people in Egypt. Most dramatic is the range of wealth, from oil rich states such as Kuwait and the United Arab Emirates (UAE including Dubai and Abu Dhabi) to the low income countries of Jordan, Syria and Yemen, where average incomes are one tenth the levels of the most affluent Middle Eastern countries. In terms of the United Nations Human Development Index, advanced countries include Israel, the United Arab Emirates, Kuwait and Bahrain, in contrast to the remaining countries, which are classified as having medium or low levels of development. 9To generalize about the state of ICT, despite its development stage, the region can be classified as a mobile telephone led information society with some countries having fully advanced ICT infrastructure. As a source of information, television is widely used, especially now that satellite TV offers a wide range of channels and the potential to access broadcasts that governments may otherwise prefer to limit. 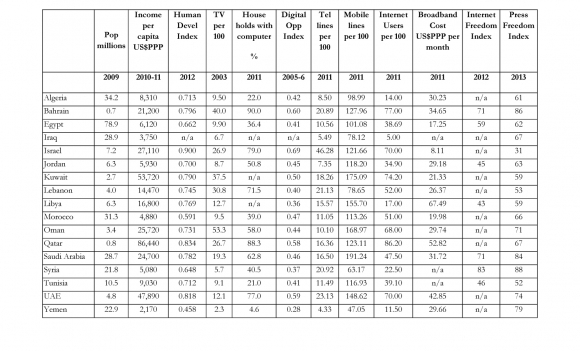 Despite its importance and near ubiquity in many countries, data on television access is limited and dated. The most recent data across all countries dates from 2003, and the lack of more recent information suggests that the technology has been surpassed by other devices as targets for data gatherers. Also, as functions such as telephone, television, and print media merge into mobile phones and computers it is increasingly difficult to isolate ICT functions to one single device. 10As the pre-eminent information source, access to TV varies from 2.3 sets per 100 residents in Yemen, to approximately ten sets per 100 in Morocco, Tunisia, Algeria and Egypt, to 53.3/100 in Oman. The range is influenced by development stage, although some middle income countries have far more televisions than advanced countries such as Israel, the UAE and Kuwait. As a potential substitute for television, computers also serve information needs. In 2011, households with a computer in the MENA region ranged from less than five percent in Yemen, followed by Tunisia (21%), Algeria (22%), Egypt (36.4%), Morocco (39%) and Syria (40.5%) with the remaining countries having more than half of all households with a computer. These data compare to more than 80% of households with a computer in Western Europe, North America and East Asia. 11The Digital Opportunity Index (DOI) was developed by the International Telecommunications Union to represent ICT opportunity, infrastructure and utilization by country. For the MENA region the most advanced ICT countries include Israel (.69), Bahrain (.60), the United Arab Emirates (.59) and Qatar (.57). In contrast, Yemen’s index of 0.28 is in the lower third of the world and indicates very limited ICT access and use. Most countries in the region fall into the mid-range of the index, populated by emerging economies. 12In the region, land line subscriptions range from less than ten landlines per 100 population in Algeria, Iraq, Jordan and Yemen to more than 45/100 lines in Israel. Landlines are no longer an accurate representation of access to communications in most of these countries as their mobile phone infrastructure expands rapidly and exceeds the reach of landlines in every case. The less developed landline infrastructure is not surprising given the development stage of most countries in the region, and contrasts the rapid uptake of mobile telephony in recent years. The range for mobile phones moves from lows of 47 per 100 population in Yemen to more than 150/100 in Kuwait, Libya, Oman, and Saudi Arabia. The country with the lowest level of mobile phone use (Yemen) has more subscribers than the highest rate for landlines (Israel) showing how quickly mobile telephony has exceeded wired networks. In many countries of the region the ratio exceeds 100 mobile subscriptions per 100 residents; only four of the 17 countries analyzed have significantly less than parity between mobile phone subscriptions and population. 13The ability of mobile infrastructure to be established quickly and competitively clearly shows in Figure 1, with the rapid adoption of mobile phones evident starting in 2005 in the countries most active in the Arab Spring. 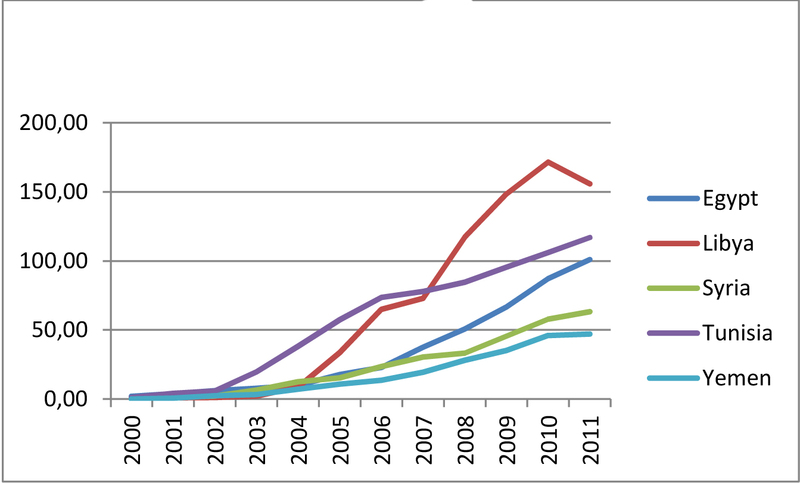 The five countries had similar levels of mobile telephony in the early 2000s, but Egypt, Libya and Tunisia had rapid uptake in the middle of the decade. 14One dimension of Internet access and use is its role as a vehicle for expression, making access important, as well as the ability to post and view content that may not serve the interests of the state or public authorities. One way of summarizing the ability to voice dissent is through indices of press and media freedom. Freedom House calculates a number of indices around freedom, including press, Internet and political freedoms. The Internet freedom index only applies to a few countries in the region so both Internet and press freedom data are presented in Table 1. In the absence of an Internet freedom index for many countries in this world region, the press freedom index is used as a surrogate. The Internet freedom index includes the ability to access ICT, controls on content and user rights and presents the results as a score out of 100. Countries with scores of 30 or less are rated as free, with other categories being partly free (31-60) and not free (61-100). The Internet freedom index for seven MENA countries shows Egypt, Jordan, Libya and Tunisia as partly free and Bahrain, Saudi Arabia and Syria as not free. Most countries have deteriorated in terms of Internet freedom between 2011 and 2012, although Tunisia improved dramatically from not free (81) to partly free (46). 15Press freedom includes the legal, political and economic environment in terms of supporting or repressing a free press. The index shows that Israel, Kuwait, Lebanon, Libya and Tunisia have a partly free press, and the remaining countries as not having any press freedom. Data on press freedom indicate the ability of residents of a country to give voice to their ideas and concerns. Countries with severely limited press freedom may apply the same constraints to online information. At the same time, the Internet may provide a way for residents to avoid censorship and seek alternate sources of information. States that limit press freedom are also likely to want to limit Internet freedom and seek ways to control access of residents to information deemed inappropriate. 16The findings of the press freedom index are reinforced by data from the OpenNet Initiative that shows a general absence of Internet filtering in Israel and Iraq, but sometimes pervasive filtering of content in Bahrain, Kuwait, Qatar, Oman, Saudi Arabia, Syria and Yemen, with some political filtering in Jordan (OpenNet Initiative 2009). In these societies, users may or may not be aware of the extent of filtering, or be able to find ways around the filtering systems. The combination of press freedom and filtering measures suggests that Internet users in most countries of the Middle East/North Africa live in an environment where the state seeks to control access to information, even if the Internet offers access to opposing viewpoints. 17While the Middle East/North Africa region contains few affluent economies, the growth of ICT, especially mobile phones, provides an important vehicle for communication and interaction. ICT can be seen as a technological and generational challenge to the hierarchical social order of many societies. Moving from 2003-5 when state control of most media limited the transmission and exchange of information in the region, to today when mobile phone penetration rates provide easy information access, residents over a short period quickly gained access to a lot of information formerly blocked. The growth of social networking, such as the 2009 introduction of Facebook in Arabic, expanded opportunities for users beyond use of former sites that required use of English. In just a few years, most countries in the region faced conflict over the demand for information and state efforts to limit access. In fact, demands for access to Internet sites such as YouTube were the cause of many early protests. The success of the Arab Spring protests may lie, in part, in the rapid adoption and use of ICT in the region, although access to ICT alone is not the sole explanation. The Egyptian students and young professionals used Facebook to exchange anonymous critiques of the government and hone strategy. Meetings and protests were organized on Facebook pages and by cell phone. The young people alerted each other to police actions by posting the news via text messaging. Once the demonstrations were launched, attacking police were met by a forest of arms holding up cell phones, arising from the crowd to record their actions on video. The results were posted on YouTube within a matter of hours (Nelson Fall, 2008, p. 14). 19Information technology can be seen as both a cause and effect for protests in the Middle East/North Africa. As a cause, protests in Tunisia started, in part, to show dissatisfaction that government limited access to YouTube and other Internet sources. Residents, especially young people, resented state efforts to control the flow of information. In Tunisia, an early cause was access to YouTube that resulted in public protests and the decision by the government to allow access in January 2011. Similar protests in Syria led to that country allowing access to YouTube in February 2011. In both cases the issue of censorship and blocking of information was a source of protest, but in each country restoring access did little to end the much broader range of issues fueling dissent. As effect, the information dissemination and organizing capacity of ICT were widely used in shaping opinion and events through the Arab Spring. 20The Arab Spring context of the protests in many countries was dissatisfaction with high rates of unemployment, especially for the educated young, government corruption, and media censorship. In Tunisia, where the movement started, Internet censorship was a growing issue as noted above. The initiating event for widespread demonstrations was the suicide death in December 2010 of Mohamed Bouazizi in the city of Sidi Bouzid to protest local government corruption. His death prompted protests, assisted in organization by social media. Even with low Internet subscription rates at the time, one quarter of the population in Tunisia was estimated to be online. While limited in access to the Internet, what Tunisia did have was almost 85% penetration of mobile phones, which provided an effective organizational network. 21News of successful protests in Tunisia spread to other countries in the Middle East/North Africa and showed the potential for public action to prompt change. One outcome was a series of demonstrations in Tahrir Square, Cairo starting on January 25, 2011. Twitter and Facebook were used to facilitate protests, although the Egyptian government tried to block access to these services. For several days all Internet and most communication access between Egypt and the rest of the world was cut. International media coverage of the protests provided traditional press reporting so that the events were well documented, and media access to direct satellite connections also provided visibility. 22One important vehicle for protest was YouTube, even when Internet access was limited. This occurs for two reasons, first as a source of content for other media sources that then relay video images through television and satellite services. The second connection is to those who do have Internet access. By mid-2011, many protest videos identified by the author were available through YouTube for Tunisia which had more than 5,000 videos on YouTube tagged Sidi Bouzid, with the following protest tagged videos for Libya (5800 videos), Syria (6000 videos), and Yemen (5500 videos). Facebook became central to the Tunisian media ecosystem because all other sites that allowed video sharing – YouTube, Daily Motion, Vimeo and others – were blocked by the Tunisian government, along with hundreds of blogs and dozens of key twitter accounts. This censorship, Sami argues, drove Tunisian users towards Facebook, and made it hard for the government to block it. The government tried in 2008, but the outcry was so huge, they reversed course. The main reason – usage of Facebook more than doubled during the 10 days of blockage as Tunisians found ways around the national firewall and onto the service. 24The early recognition of ICT as a force in the Egyptian upraising was an element in media reports. One way to capture the character of an event is through the language and words used, with word clouds one way to represent information (McNaught and Lam 2010). The word cloud presented in Figure 2 shows the frequency of terms used in The New York Times during the early days of the Tahrir Square protests in Cairo. The word cloud captures the text of all articles that referenced the Egyptian protest movement over three days. Twitter was a common term used frequently by journalists as part of their reporting and explanation for protests. After several days, reporting focused much more on issues faced by residents of Egypt and the significance of Twitter declined. The second word cloud (Figure 3) covers the first week of protests and shows how core protest issues take prominence as the technology faded as a factor. 25The power attributed by media and observers of the protest movements faded as virtual protests were replaced by protests in real places. While ICT played a role in facilitating events and disseminating information, and was a popular story line for mass media, the attribution of movements to technology alone was exaggerated. 26The events of the Arab Spring continue to unfold but efforts by protesters and governments led to a number of unintended or unforeseen consequences. As governments sought to close or limit access and use of ICT they also limited business interaction and commerce, while cutting access to the Internet and mobile phones also led to public protests. Tunisia and Egypt cut access to mobile services and the Internet, but in some cases that action encouraged people to leave home and seek information and join protests. Arab Media (2011) notes that when young people lost access in Cairo they left home to find more information, followed by parents trying to find their children when mobile phone service was cut. The online and virtual protests taking place were stopped by government action, but that only served to move people outside and into public places where protests continued in real space. 27The belief that uploading video to YouTube and related sites directly influences opinion may be tempered with the realization that regimes will do all they can to control access within a country. The power of uploaded images is not so much the internal audience, but the international audience that reacts to the images. For example, YouTube was blocked in Tunisia but could be accessed externally. Protest images uploaded from Tunisia to YouTube through external links could be accessed outside the country. News broadcaster Al Jazeera, among others, was able to access footage of Tunisian protests and broadcast to a wide audience through satellite television. Tunisians saw images of local protests relayed via YouTube and then satellite television. The power of the Internet is this case was relaying protest information to news media rather than directly influencing events. 28As protest movements gained momentum they gained a lot of support from western democracies wanting to support regime change. As new initiatives to promote ICT access and provide covert access were established by the major powers, questions were raised about the true intent of their actions. Sami Ben Gharbia (2011) reports that western support for Internet freedom and activism could mask strategic geopolitics and harm local activism. Internet freedom for countries with repressive regimes is growing as a movement in the United States and has ICT corporate support, with firms such as Yahoo and Google aligning their interests in global markets and information access with US foreign policy. 29The United States and other countries are investing in circumvention projects, such as Haystack and Internet in a Suitcase, as a way to provide communications to opposition movements. These systems are designed to allow protest movements to gain access to information and to allow reporting of opposing actions. These technologies raise a number of issues, especially for the security and safety of users. If governments gain access to clandestine ICT networks it would be possible to identify protestors and monitor their actions. In exercising control to limit voice, however, countries also can hurt the interests of elites, creating internal conflicts. Closing or limiting ICT access may stifle dissent but it can also limit business interaction and commerce. One constraint on Mubarak’s control of the Internet was that stopping online dissent also meant stopping service to the Egyptian Stock Exchange (Tsotsis 2011); ISP Noor tried to close down all access except to aviation, banking and finance services. 30Analysis of the Arab Spring is useful for a number of reasons. First, it exemplifies how new technologies can be used unexpectedly or with more power than anticipated. The cultural context of ICT in this case saw it used to facilitate protests, and briefly outdistance government’s ability to control a rapidly changing ICT environment. Second, the speed of events and lack of a social science research environment makes it difficult to ascribe shares to the role of different media and technologies. Often, the early protests in Tunisia and Egypt were portrayed in the press as being caused by access to new media, without recognizing the ability of societies to foment protest as they have done in the past. Third, the unintended consequences show how different societies use and react to new information technologies. Efforts to limit online protests led to demonstrations in physical space that had far reaching implications. Finally, the experience of the Arab Spring serves as a reminder that ICT is part of a larger, ongoing tension over control of ideas and space; the technology may be new but the underlying issues that cause protest movements have long historical antecedents. As Barney Warf (1997) reminds us, ICT is just a new element in the battle over contested spaces. BILBAO-OSORIO B., DUTTA S. & LANVIB B. (Eds) (2013), The Global Information Technology Report 2013, Geneva, World Economic Forum. BEATTY L.M. (2010), “Democracy activism and assistance in Burma”, International Journal, vol. 65, n° 3, pp. 619-636. CHAISUKKOSOL C. (2010), “The Internet & Nonviolent Struggle: The anti-government movement in Thailand 2005-06”, Social Alternatives, vol. 29, n° 3, pp. 49-55. FROEHLING O.R. (1997), “The Cyberspace "War of Ink and Internet" in Chiapas, Mexico”, Geographical Review, vol. 87, n° 2, pp. 291-307. ITU (International Telecommunications Union) (2012a), Measuring Information Society 2012, Geneva, ITU. JEFFERSON T. (2007), “The use of ICTs in regional conflicts, war, and terrorism”, VINE, vol. 37, n° 1, pp. 14-17. NOVAK J. (2010), “Comparative Counterinsurgency in Yemen”, Middle East Review of International Affairs, vol. 14, n° 3, pp. 12-28. PALFREY J. (2010), “Four Phases of Internet Regulation”, Social Research, vol. 77, n° 3, pp. 981-1003. WARF B. (1997), “Counterhegemonic discourses and the Internet”, Geographical Review, vol. 87, n° 2, pp. 259-274. Mark I. Wilson and Kenneth E. Corey, « The role of ICT in Arab spring movements », Netcom, 26-3/4 | 2012, 343-356. European ICT Spatial Policies: does a Political European Information Society Model exist ?